We are half way through the school holidays and Hollie and I have been busy playing and crafting. Hopefully next week will be better weather so we can get in the garden, we can hope! For this weeks Mojo Monday Sketch 287, I decided to use one of my new stamps from Clearly Besotted. The stamp set is called Love Hearts and I love the patterns on the hearts. While testing out the stamps, I had used a purple ink and decided to use the purple and co-ordinate it with the Basic Grey Kioshi papers as it has some lovely purples and greens in it. I did have the urge to add some stitching around the outside but decided there was enough going on on the card and seeing the card finished, I would have liked to ink the edges of the papers a little so they stand out more against the white. 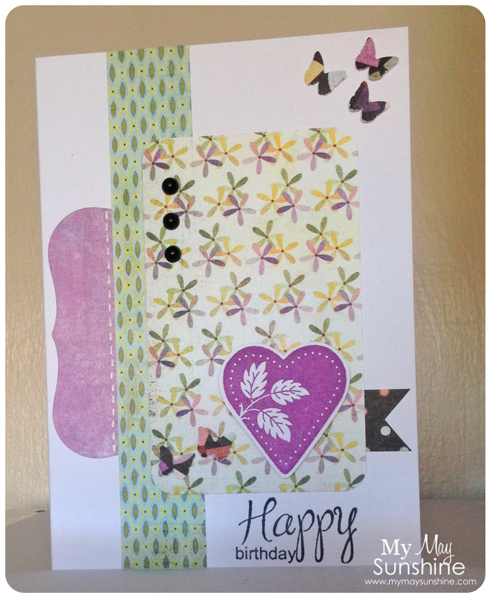 Paper – Basic Grey Kioshi | Stamps – Amy R It’s your birthday and Clearly Besotted Love Hearts | Label – Spellbinders Nestabilities label one | Butterflies – Martha Stewart punch | Gems – Hobbycraft.